This visored 3 1/2" LED Spot Light brings LED technology and LED brightness to the motorcycle market. This compact DOT approved LED light comes with built in visor and fits most light bars. You can easily replace your older style 4 1/2" Halogens with this cutting edge design LED Spot Light. 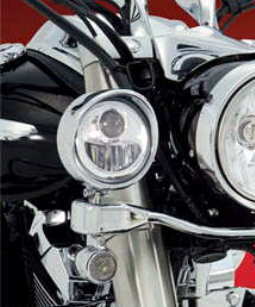 Optional lights for the Big Bike Parts Elliptical Light Bars.